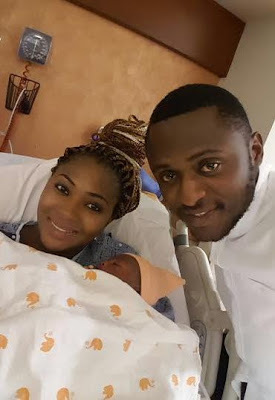 The first wedding anniversary of the celebrity couple; actress, Lilian Esoro and Ubi Franklin was yesterday and the couple left a lot of dots for the media to connect, according to Goldmyne TV. Surprisingly, Lilian totally ignored this date. She didn’t bother marking it on Instagram or anywhere, unlike her hubby who marked it on IG, later in the day. The true story on their alleged split has emerged. As reported by a reliable source, their marriage has crashed and Lilian had ended the marriage. One might feel it was just an issue of adjusting to a new life, which sometimes comes with motherhood. Besides, some new moms suffer from Postpartum depression which can make them take out their frustration on their spouses. It’s been almost four months and the couple is doing little to quell the speculations. Well, let’s just say Lilian is making it quite obvious. It was also added that Lilian had walked out on her marriage immediately their son, Jaden was born and is adamant not to return. Their issues reportedly stem from infidelity to domestic abuse. If you recall, their relationship has always been rocky from the moment he proposed to her. Lilian Esoro rejected the proposal and was literally begged to accept him. He even flew all the way to the United States America to win her back. This was because she was not expecting a proposal in such a short time. Her family also cajoled her to marry him as he was quite generous to them. Even after accepting his proposal, they split once again and he begged her yet again before she finally agreed and got married. In a year of marriage, they have welcomed a son and this has sparked reports she must have gotten pregnant before their marriage was official. At the moment, Lilian has moved out of their house and is finding comfort in her family who are in support of her decision. Meanwhile, Ubi is doing all he can to win her back. He has also tried to keep their situation under wraps. As if to add fuel to the fire, Lilian totally ignored the launch of Ubi’s new lounge last week. She did not make reference to it, promote it neither did she attend it. Rumour has it, he opened it to win her back. Meanwhile, a notorious Nigerian blogger based in Germany has alleged that Lilian Esoro cheated with a prominent Nigerian footballer some days to her wedding thereby causing a crack in her union after Ubi got a wind of her actions. The insinuations have since remained unfounded as both parties have refused to address their issues surrounding their ailing marriage in the media.